Our popular BASview building supervisor is now faster and better than ever. With the release of the BASview2, we are now using HTML5 instead of Flash, allowing the BASview2 to work seamlessly on smart phones and tablets. We also gave it a large speed improvement from 200MHz to 1,200MHz so screens load instantly. The fast speed comes with the same easy set-up and programming. One of our customers told us they love the BASview because "you can use the BASview to do an application without attending a 5-day training session and passing an exam." It's easy to understand and configure a BASview2 using its stand-alone, embedded, web-based graphical interface. No special software required. Supporting up to 2,000 nodes, the BASview is ideal for small to medium applications that require a simple-to-use graphical interface with no licensing requirements. The BASview2 can be accessed from any web browser — providing client functionality to any BACnet/IP or Modbus TCP system. By using Contemporary Controls BASrouter or BASgateway products, additional protocols such as BACnet MS/TP and Modbus RTU are supported. The product group of I/O modules of the MIX series has been designed for building distributed control systems using JACE or AAC20 devices. In order to ensure high versatility and price performance, all the MIX Series modules have been equipped with the most commonly used types of I/O in building automation (MIX of all types of I/O in one unit). This is a big update to the existing Pi 3, including a re-spin of the BCM2837 CPU (running faster at 1.4GHz), new dual-band wireless connectivity (so you can connect to both 2.4- and 5-GHz WiFi networks), better thermal control, and more. As always, you'll need an up-to-date Raspbian SD card, but the new model is backwards-compatible with all previous models and runs the same operating systems and programs. Devices like WiFi plug, Door sensor, PIR sensor (with motion, light, temperature) etc. They support Amazon Alexa and Google Home. Announcing the new BACnet IoT Gateway! The new FieldServer BACnet IoT Gateway from Sierra Monitor Corporation (OTC:SRMC) elevates the BACnet explorer function and diagnostic tools to a new level of performance and simplicity. The new BACnet IoT Gateway combines a flexible and easy-to-use Explorer with SMC’s field-proven BACnet protocol stack, and extends network monitoring and control to the SMC Cloud. Now, systems integrators can take advantage of powerful features integrated into the SMC Cloud, including remotely accessing the gateway from anywhere, monitoring specific devices, objects and properties, and setting alarms for pro-active notification of problems. 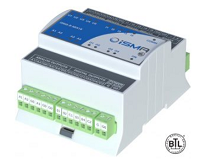 SMC designed the BACnet IoT Gateway to help systems integrators be more efficient in managing and maintaining networks. Water Hero sends text & e-mail leak alerts based on user configurable parameters such as continuous flow and temperature. This minimizes false positives by allowing you, the owner, to adjust settings as needed and offers you the most advanced water leak protection that fits your needs. Together, the Rachio 3 Smart Sprinkler Controller and Wireless Flow Meter deliver the ultimate smart watering experience. The Rachio 3 Smart Water System brings together leading smartphone sprinkler control, advanced Weather Intelligence™ Plus and precise flow monitoring to help nurture a beautiful yard. Protect your investment with Wireless Flow Meter leak detection.